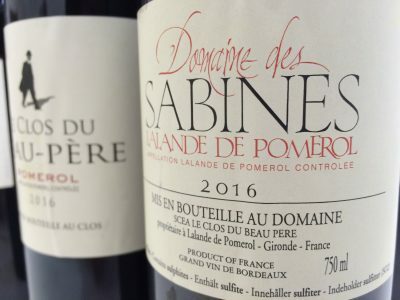 The best wines in Lalande de Pomerol in 2016 have really good succulence and texture. My picks? Jean-Luc Thunevin has produced another beauty at Domaine des Sabines [pictured left]. This wine shows remarkable consistency year to year. Hubert de Bouard has produced two terrific wines in La Fleur de Boüard and Le Plus de la Fleur de Boüard. The former is ravishing; the latter profound and concentrated. Château La Fleur St George, another de Boüard property, also looks good. Château Grand Ormeau, Château Jean de Gué, La Sergue, Château Saint-Jean de Lavaud and Château de Viaud all impressed at the Grand Cercle tastings. Château Siaurac and Château Tournefeuille, two well-regarded properties, also show promise. Siaurac was a little backward but nicely structured and Tournefeuille displayed plenty of joyful fruit. The following wines [in alphabetical order!] were tasted blind at the Grand Cercle during primeurs week [in the main] as well as at Chateau Angélus and in the cellars of Jean-Luc Thunevin. 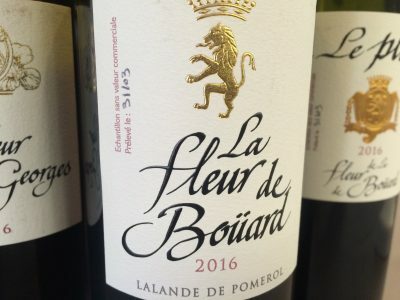 La Fleur de Boüard: best ever in 2016?